11.19.2004 - Here is a close-up photo of squirrel poop. I took it from an un-insulated section of attic space, or essentially, above a ceiling in a house that was filled with squirrels. The squirrels left thousands of droppings sprinkled throughout the attic, but this was just one tiny area. Most of the squirrel turds in this area are pretty fresh. Though some are old, you can see that they are drier or have mold growing on them. It's often hard to distinguish between squirrel and rat droppings. 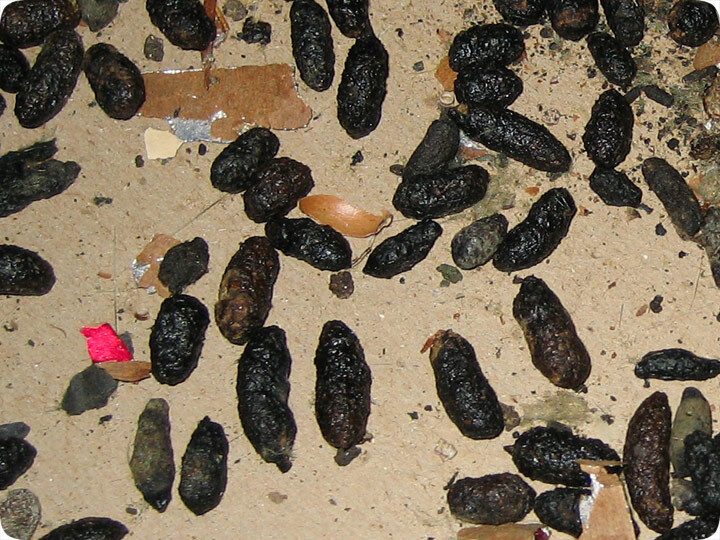 Squirrel droppings are just slightly larger, and slightly shorter with more rounded ends. But it's not always a hard and fast rule, and oftentimes the poo of squirrels can be confused for that of rats, and vice versa. It's much easier to tell, upon attic inspection, which animal you have based on other factors. For instance, rats leave lots of trails throughout the attic, and squirrels are more likely to stick to the edges. Also, each animal has a specific general scent from glands, oils, fur, urine, and other factors. In the above job, I trapped and removed all of the squirrels, and sealed all of the entry points shut so that no more squirrels could get back in again. I then removed all of the droppings that I could, via vacuum, and fogged the rest of the attic with Bioshield to break down the droppings in the insulation that I could not vacuum out. In My House: Squirrel Droppings? Finding in your house, squirrel dropping is the first sign of an infestation. The amount of droppings that you find will give you a hint of how bad the infestation is. The more that you find the more squirrels you have. You should also look for signs of age on the droppings that means that you should pay attention when looking at the droppings to see if they are fresh or if they have been there for a while. The reason that is important is because there is a chance that the squirrels are not there anymore. Old droppings are light in weight in color and fresh are tacky and dark. If the droppings are old and you are sure that the squirrels are not there anymore you should look for a hole where they could have come in through and plug that hole as soon as possible. If the droppings are fresh then chances are that the squirrels are there still. If that is the case you need to trap all of the squirrels and then plug the hole. You should also clean all the droppings you find by combining one third of bleach and two thirds water so that you kill the germs that may be present at the location where you found them.